It is often necessary to run a "numerical experiment"; a term which highlights the analogy between running a numerical simulation and performing a physical experiment. In a numerical simulation, the experimental apparatus consists of a collection of computer programs executed on computers. The computational software or "codes" are the translation, via numerical algorithms, of the mathematical equations of the physical models being investigated. Before and after the calculation, the environment software manages several complex operations for preparing the computations and their analysis. 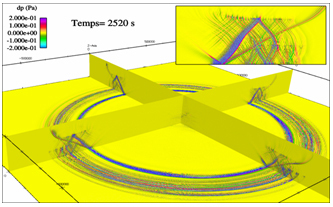 Numerical simulation of complex multiple physical phenomena, whilst respecting the relevant scales in space and time, requires a large number of calculations to be performed which use and generate large volumes of data on powerful computers: this is high-performance computing.